Deogarh lying in the Lalitpur district just 123 km from Jhansi (UP), is of great antiquarian, epigraphical and archaeological importance and has figured in the history of the Guptas, the Gurjara – Pratiharas, the Gondas and the British. Deogarh is situated on the right bank of the Betwa, at the western end of the Lalitpur range of hills. The cliffs immediately overhanging the bank rise to a height of 300 ft. and form a long steep ridge of red sandstone. The river takes a deep curve to the west at this juncture and passes through the extremely picturesque countryside. The water of the river is deep green here and a small island clad in rich verdure, located in the middle of the river, lends an added charm to the site. UP tourist bungalow and dharamashala are available for accommodation. Air: Nearest airport is Gwalior 235 km from Deogarh. Rail: Nearest railway station is Lalitpur 33 km from Deogarh. Road: Deogarh is connected with regular bus services from Lalitour and other part of the state. Dashavatar Temple: The fine Vishnu Temple at Deogarh belonging to the Gupta period, popularly known as Dashavatar Temple. The terraced basement above the high temple plinth is adorned with a continuous row of sculptures panels. A highly carved doorway with Ganga Yamuna figure lead to the sanctum or garbhagirha. Three big rathika panels spread in the sidewall have Vaishnava mythological scenes carved in high relief – the Gajendra moksha panel, Nara – Narayan tapsya and the Anantshayi Vishnu. 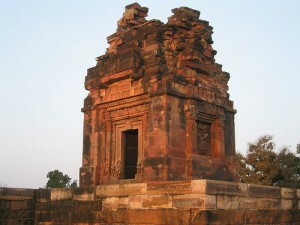 The Dashavatar Temple at Deogarh is noted for being the first northern Indian temple with a shikhara or spire. 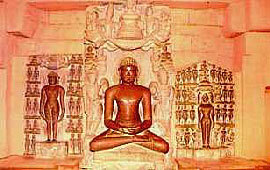 Jain Shrines: The groups of 31 Jain Temples are located here. The site was a Jain centre from the post Gupta time upto the 17th century. Panels depicting scene from Jain mythology, Trithankara images, a votive pillar, votive tablet, Jain images visible from all sides and a pillar carved with a thousand Jain figures are found here. Chanderi: A town that is famous for its gossamer Chanderi saris has also some of the finest example of Bundela Rajput and Malwar Sultanate architecture. A magnificent Mughal fort dominates the skylight of this old town. Among the sights are the Koshak Mahal, an old palace built in 1445 A.D., the Badal Mahla Gate – a victory arch, the imposing Jama Masjid, the Shazadi-ka-Rouza, a building with decorative arches and the Parmeshwar Tal. Chanderi has also a number of Jain Tempe. This entry was posted in Deogarh, Uttar Pradesh and tagged Historical Place, Holy Place. Bookmark the permalink.